50 children of three nursery schools of Bocholt visited the company Pieron at Schlavenhorst yesterday. The boys and girls attended the “Day of the Little Scientists”. Veronika Dorste, Wirtschaftsförderungsgesellschaft of the district Borken, arranged experience stations for them in the event room of the steel spring manufacturer. The kids could mix colors, craft boats or catapults at the tables. „The kids get only little guidance and are supposed to just try”, Droste says. 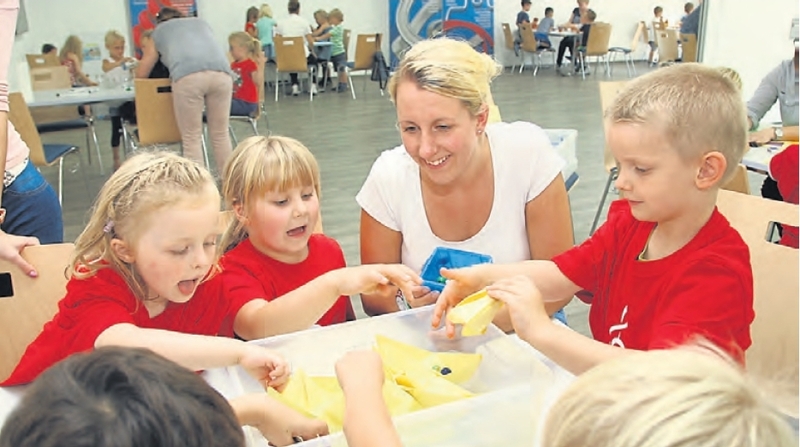 She is taking care for the kindergartens in the district that bring the children the playful way close to natural sciences, mathematics, and technique through the foundation „Haus der kleinen Forscher“. „Usually I am doing advanced training for kindergarten teachers”, so Droste. But this time, the teachers were allowed to bring along the kids, too. “This way, both share the learning.” The children came from the kindergartens St. Martin, St. Josef, and St. Theresia.